This week the team wrapped up the first phase of our project and got started laying the groundwork for our new direction as of Tuesday. We have parted ways with our initial client, but remain committed to working in the STEM games space. – As our initial project is under NDA we can’t disclose any further details, but our new project has no such restrictions. All newsletters from Week 3 forward will now be available on our website, which is no longer private. – After setting off on this new path, the team first aimed for building an educational game for high school student about physics. We did some research into existing physics games and looked at several areas we could dig into, but our advisors encouraged us to base our new game on solid existing research. – John reached out to some of his contacts at HCII seeking people who might be interested in collaborating with us or who might be able to direct us to some promising research. Derek Lomas pointed us towards the research of Stella Vosniadou. – We then got to work analyzing Stella Vosniadou’s research into misconceptions elementary school aged children have about the relationships between the earth, the moon, and the sun. Her research looks like a promising foundation for us to base a game around, and will let us stand out from the crowd of other STEM games online which tend to be about math and physics. – We also finished our team logo and team poster! Additionally, work has begun on the team description and website, which will officially open next week. In closing, we’d like to extend an extra special thanks to our advisors, Drew Davidson and Mike Christel, for their guidance and support this week. We’d also like to thank all the other parties we reached out to as we searched for a new direction and target for our project this semester. We’re looking forward to getting busy designing a game around our newfound direction starting next week! 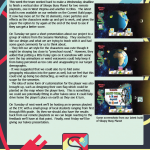 – After deciding to adopt Stella Vosniadou’s research as the basis for our game late last week, the team started the week off by enumerating some of the common misconceptions children have about the earth and the sun, pictured on the right. We then began working on a design that gives kids the information they need to break down their old, flawed mental models of how the earth and the sun function and replace them with a more accurate model. 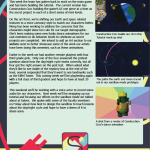 – The initial design for our game, currently titled “Sleepy Busy Planet”, came together by the middle of the week. Four characters spread out across planet earth are collaborating to build a top secret ultimate project. Each has something they can contribute to make their shared dream a reality, but they can only work when they are awake. The player must decide how far to rotate the earth to wake up each character as different resources are needed throughout the secret project. As the game continues, the player will discover what lies behind the top secret curtain. 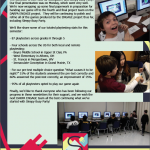 Our preliminary design is shown on page 2.- We have pitched our design to our advisors and other members of the faculty, including Anthony Daniels , and have gotten a lot of positive, constructive feedback. Anthony also agreed to record a voiceover for our game’s introduction. – We’ve finished all of our branding obligations and our new public website is now online for all to see! – The team has also been ramping up with a Unity3D gold spike that we hope to show next week at quarters. After letting some pipeline problems go unanswered for far too long on his project last semester, Ken vowed to not let that happen again. He has been working to analyze our workflow and divide up art and programming tasks to improve efficiency and not let the desire to hurry and make up for lost time lead to mistakes that could hurt us later in the semester. That’s all for week 4! Our team’s quarters presentation is next Wednesday. Then we move on to making something stellar to show at halves! This week the team finished work on the Quarters build of our prototype, which we used to present our current game design to the faculty at our Quarters presentation on Wednesday. 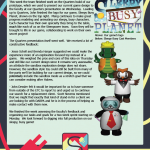 Leading up to Quarters, John finished the logo for our game, Sleepy Busy Planet, shown on the top right. Meng continues to make great progress modeling and animating our sleepy, busy characters. Each character has their own specialty they bring to the table, much like each of us on the Stempower team. Soon they will be brought to life in our game, collaborating to work on their own secret project! – Jesse Schell and Brenda Harger suggested we could make the experience more of an exploration focused toy instead of a game. We weighed the pros and cons of this idea on Thursday and still like our current design since it remains very assessable, an attribute the sandbox exploration design does not share. However, the sandbox style toy could still be built from many of the parts we’ll be building for our current design, so we could potentially include this sandbox mode as a stretch goal that we can consider making after Halves. make contact with them now. We finished the week assessing the faculty’s feedback and organizing our tasks and goals for a two week sprint starting on Monday. We look forward to digging into full production on our sleepy, busy game! This week our team has been busy working towards turning our first prototype into a playable game. We’ve started using Agile and Scrum to plan and steer our development and are now halfway through our first two week sprint. We are aiming to have our first gameplay prototype up and running by the end of next week. John has begun reaching out to some of his contacts at schools in Ohio and Virginia to set up some remote playtests. We hope to run these playtests shortly before halves. 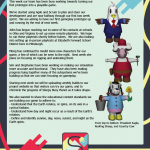 We are also looking into setting up in-person playtests at Elizabeth Forward School District here in Pittsburgh. Meng has continued to model more new characters for our game, a few of which can be seen to the right. Next week she plans on focusing on rigging and animating them. Sim and Stephanie have been working on making our simulation more accurate and functional. They have also been making progress tying together many of the subsystems we’ve been building so that we can start focusing on gameplay. Starting next week we will be uploading weekly builds to our project website so that visitors can try our game, and to chronicle the progress of Sleepy Busy Planet as it takes shape. – Understand that the Earth rotates, or spins, on its axis in a cyclical fashion. – Understand how day and night occur as a result of the Earth’s rotation. The team has completed our first two week sprint of Agile development! We’re pleased with how it has helped shape our workflow. Our goal was to get our prototype into a playable state so that we can begin playtesting starting next week and feel we have hit that target. 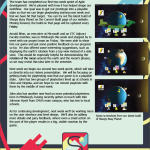 You can try out the latest build of Sleepy Busy Planet on the Current Build page of our website. Moving forward, the build on that page will be updated every Friday. Arnold Blinn, an executive at Microsoft and an ETC Adjunct Faculty member, was in Pittsburgh this week and stopped by to meet with our project team on Friday. We were able to show him our game and got some positive feedback on our progress so far. He also offered some interesting suggestions, such as displaying the earth’s rotation from a top view instead of a side view. This would be especially helpful for demonstrating the rotation of the moon around the earth and the moon’s phases, so we may revisit this idea later in the semester. them by the middle of next week. John also has another new lead on more potential playtesters here in Pittsburgh, having recently gotten in touch with Kim Johnson Hyatt from CMU’s main campus, who has ties to local schools. As for continuing development, next week we’ll be working more on the user interface and level design. We’ll also be adding more details and juicy feedback, where even a small action on the part of the player results in a big, visible reaction by the game. This week the team worked hard to make a Wednesday deadline to finish a vertical slice of Sleepy Busy Planet for two remote playtests, one in West Virginia and another in Ohio. The latest build is now available on our website on the Current Build page. It now has more art for the UI elements, more particles and effects as the characters wake up and get to work, and gives the player the option to try again at the end of the level to see if they can get a better score. On Tuesday we gave a short presentation about our project to a group of visitors from the Sesame Workshop. They seemed to like our design and what we are trying to teach with it and had some good comments for us to think about. – They felt our art style for the characters was cute though it might be straying too close to “preschool round.” However, they added that putting a little funky spin on it somehow with some over the top animations or weird voiceovers could help keep it from being perceived as too cute and unappealing to our target demographic. – It was suggested that we could also try to fold some geography education into the game as well, but we feel that this could end up being too distracting, as well as outside of our scope for the semester. – The idea of some form of customization for the player was also brought up, such as designing their own flag which could be planted on the map where the player lives. This is something we could see potentially fitting in after halves since it could help drive home the player’s place on earth as they see it turn. 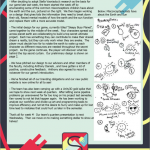 On Tuesday of next week we’ll be hosting an in-person playtest at the ETC with a small group of local students ranging from first through fifth grade. By then we should also have the results back from our remote playtests so we can begin reacting to the feedback we’ll have at that point. Finally, next Friday we’ll be giving our halves presentation. 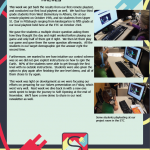 remote playtest on October 19th, and six students from Upper St. Clair in Pittsburgh ranging from kindergarten to fifth grade at our local playtest held here at the ETC on October 23rd. We gave the students a multiple choice question asking them how they thought the day and night worked before playing our game and only half of them got it right. We then let them play our game and gave them the same question afterwards. All the students in our target demographic got the answer right the second time. Furthermore, we wanted to see how intuitive our control scheme was so we did not give explicit instructions on how to spin the Earth. 80% of the students were able to get through the first level with no outside instructions. Students were also given the option to play again after finishing the one level demo, and all of them chose to try again. This week was light on development as we were focusing our efforts on preparing for our Halves presentation on Friday, which went very well. Next week we dive back in with a new one week sprint to begin the journey to Soft Opening at the end of November. We’ll have a new demo to share in our next newsletter as well. This week the team has gotten back to work on the main game and has been building the tutorial. The current version has Construction Croc building the game’s UI one piece at a time as the secret project in each of a short series of mini levels. On the art front, we’re shifting our Earth and space related textures to a more cartoony style to match our characters better. Meng has been working to address the concerns that the characters might skew too cute for our target demographic. She’s been making some new funky dance animations for our cast members to do between levels to celebrate as secret projects are completed. We intend to add an Art section to our website soon to better showcase some of the work our artists have been doing this semester, such as these animations. Earlier in the week we had another remote playtest with four third grade girls. Only one of the four answered the pretest question about how the day/night cycle works correctly, but all four got the right answer on the post test. When asked what they’d like to see inside of the mystery box at the end of the level, several responded that they’d want to see landmarks such as the Eiffel Tower. This coming week we’ll be playtesting again with a full class of third graders and hope to have at least 20 players. This weekend we’ll be working with a voice actor to record some audio for our characters. Next week we’ll be wrapping up our tutorial and focusing our efforts on the sandbox mode we talked about at halves. We spoke with some of the faculty members on Friday about how best to design the sandbox to teach lessons about the day/night cycle and hope to have a demo of it to share soon. After discussing the current state of Sleepy Busy Planet with some faculty members we came to realize that the game still has some problems that need addressed. It is a somewhat complex game and requires the player understand the concept of time zones, but teaching time zones is not part of our research or our educational objectives. We have decided to spend our efforts that were going to be on sandbox mode on building a new prototype to stand alongside and complement Sleepy Busy Planet, and Sleepy Busy Party is the result. sent to a big party at the end of the game and a new character will appear on the globe to take their place. The more answers the player gets right, the more characters get unlocked and show up at the party. We did some A/B testing of both Sleepy Busy games on Thursday at a remote playtest with seventeen third graders in Athens, Ohio. We are still waiting to get back full post game survey results, but the response to the game as described to John over the phone by the teacher was very positive. Our games kept the full class busy and engaged for an entire 40 minute time slot. Sleepy Busy Planet was slightly more popular then Sleepy Busy Party overall, but multiple students asked if they could play both games more at home. We also got lots of positive feedback about the art style on the characters as well as the time requests machine on the bottom right of the screen. We’ll have more detailed feedback in next week’s newsletter. 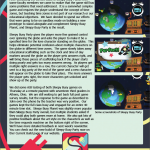 You can check out the new build of Sleepy Busy Party now on the Current Build page of our website. This week the team continued to tune up and polish Sleepy Busy Party and also worked on preparing for Soft Opening, which falls on the Monday after Thanksgiving Break. At Soft Opening, project teams present their work so far in person to small groups of faculty throughout the day, similar to Quarters presentations. One of the biggest things due for Soft Opening is the 3 minute promotional video. Meng has been hard at work doing animations for the video, which you’ll be able to check out at our website on 11/27. Often videos like this will go with an interview format, but we’ve opted to put a spin on that and have our characters be the ones being interviewed instead of ourselves. You can see a screenshot from the video in progress on the right in the center. Last week’s remote playtest results came in on Monday. We tested both Sleepy Busy Planet and Sleepy Busy Party with a group of 17 third grade students, 9 girls and 8 boys. Only 8 out of the 17 got the pre-test question correct, and 11 out of 17 got the post-test question correct. None of the correct answers from the pre-test switched to incorrect in the post-test. When asked which game they preferred, 11 chose Sleepy Busy Planet and 6 preferred Sleepy Busy Party. The characters were all a big hit, and Professor Cat continued to be a big favorite. We also got a lot of positive feedback about Prankster Platypus, who swoops in on a bungee cord to swipe the clock as a part of the educational scaffolding. We’ll be travelling to Upper St. Clair on November 30th for an in person playtest, and John is also looking into a new school in Texas for more remote playtesting later this month. 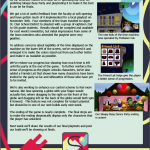 Work on Sleepy Busy Party also continued this week, focusing more on details like UI layout and animating more elements of the scene to bring it to life. We’re nearly finished with the intro animation, and have been planning out and working on assets for the big party that constitutes our ending. There will be no newsletter next week due to Thanksgiving Break. We’ll be back with another newsletter in 2 weeks on November 30th. As the semester comes to a close we’re spending our time on polishing Sleepy Busy Party and playtesting it to make it the best it can be for finals. We got a lot of useful feedback from the faculty at soft opening and have gotten much of it implemented for a local playtest on November 30th. Four members of the team traveled to Upper St. Clair School District to playtest with a group of eighteen 2nd to 5th grade students. 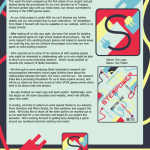 Results should be compiled and available for next week’s newsletter, but initial impressions from some of the team members who attended the playtest were very positive. To address concerns about legibility of the time displayed on the machine on the lower left of the screen, we’ve recolored it and enlarged it to make the colors stand out from each other better and make it as readable as possible. We’ve redone our progress bar showing how much time is left until the party at the end of the game. To further reinforce the sense of progress as the player unlocks characters, we’ve also added a Friends List that shows how many characters have been invited to the party so far and silhouettes of those who have yet to be invited. We’re also working to enhance our control scheme to feel more natural, like how spinning a globe with your finger would actually feel, where dragging to the right on the front of the globe and dragging left on the back of the globe would both spin it forward. This feature was not complete for today’s playtest but should be in one of our next builds early next week. The ending of the game is nearly complete. The final steps are to make the ending dynamically display only the characters that the player has unlocked. Next week we’ll share the results of our final playtests and post our build we’ll be showing at finals. – For our pre-test multiple choice question “What causes it to be night?” 51% of the students answered the pre-test correctly and 66% answered the post-test correctly, an improvement of 15%. 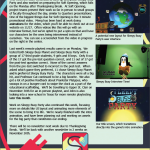 Finally, we’d like to thank everyone who has been following our progress in these newsletters for their support, and we wish the next DARPA ENGAGE team all the best continuing what we’ve started with Sleepy Busy Party!